It's time for a new challenge @ 613 Avenue Create & our optional theme this week is to create something with the sights/sounds/tastes of summer in mind! One of our sponsors is The Stamping Chef & I chose to use the Milkshake Anyone?! image...what better way to represent summer than a nice cold milkshake??? Once again, my daughter has done a wonderful job coloring...I truly enjoy admiring her work!!!! My teammates also created some FAB works of art so check out our blog to see what they came up with & while you're there; read up on our rules so you can play along with us!!! I'm looking forward to checking out your wonderful creations....have fun everyone & happy stamping!!!!! Love this image and layout. The colours are great together. Great coloring, super papers and nice design! Well done indeed! Love what you did with this image. She is one of my favorites!! What a fun card! Great coloring and I love the papers you chose. 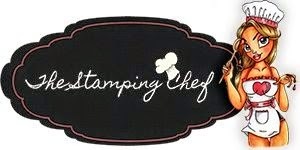 Thanks for joining us at The Stamping Chef this week. What a lovely card. I love the image and your great coloring. Fabulous layout. I love your card, it has food and ribbon so you could enter my challenge too! Love this! Love your coloring! I love the colors you have used.. the dark gray is fantastic!! LOVE It!! Thanks so much for playing along with us at Open-Minded Crafting Fun Challenges!!! Good Luck! I hope we see you again!! 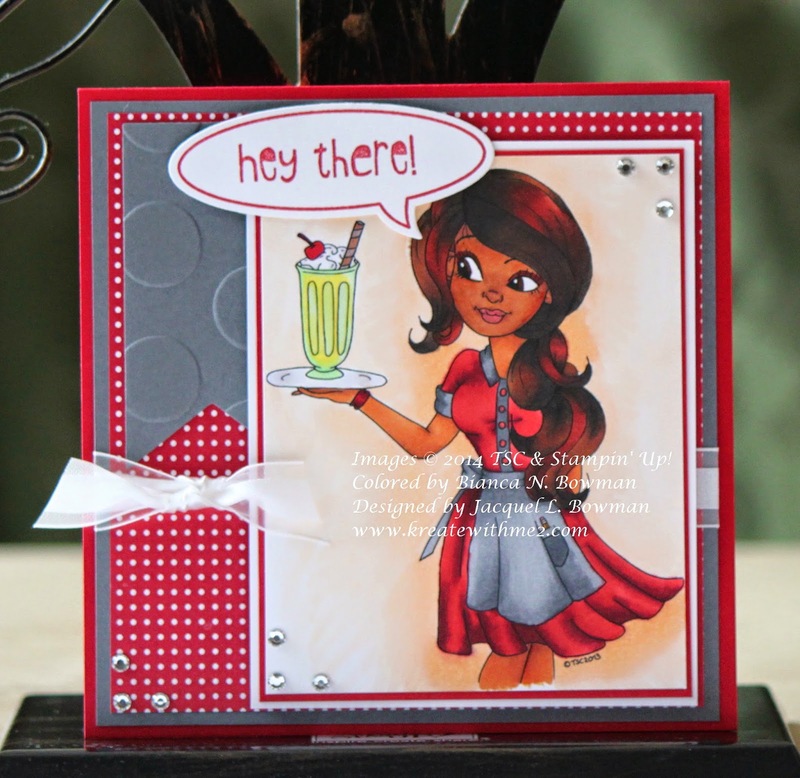 This card has a great retro feel to it, and the colors are perfect for this kind of 50s style. The papers match the colors of the image perfectly! wow totally awesome layout! love the embossing! You make the cutest little scrapbook-like projects!